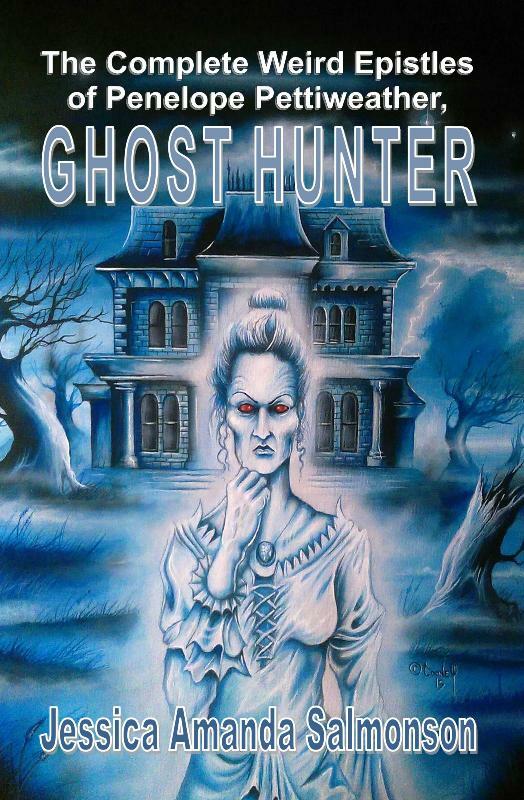 The Complete Weird Epistles of Penelope Pettiweather, Ghost Hunter from Jessica Amanda Salmonson: fourteen stories — or epistles, rather — detailing Penelope’s quest to understand the nature of ghosts. Full of the rich history and landscape of Salmonson’s northwest USA, these quiet tales will appeal to the fan of the traditional ghost story. Theo squatted down. He heard his knees crack. The fire itself was strangely quiet. He stared into the blaze, mesmerized by the weird beauty of the hounds. Then the fire flared again. It seemed the hounds had leapt across the hearth! Theo started to stand, shouting but they bore him down. Their snarling was the sound of an inferno. They fastened to his neck and right arm. The flashlight went rolling. He choked out one more shout, then burning fangs tore out his vocal cords. Jessica Amanda Salmonson is a recipient of the World Fantasy Award, ReaderCon Certificate, and Lambda Literary Award. Her previous books include What Did Miss Darrington See? : Feminist Supernatural Stories of the 19th and 20th Century from the Feminist Press at CUNY; two volumes of Tales by Moonlight from Tor Books; The Encyclopedia of Amazons from Paragon House, and Anchor Doubleday; Anthony Shriek,set in the streets of Seattle, from Dell Abyss Books, and the Centipede Press; Amazons!and Amazons II from DAW Books; The Swordswoman from Tor Books and the Science Fiction Book Club; The Tomoe Gozen Saga in three volumes from Ace Books, and Open Road Media; The Death Sonnets from Rainfall Books; and Pets Given in Evidence of Old English Witchcraft and Other Bewitched Beings from the Sidecar Preservation Society. The book is available via Amazon (here and here) and other good dealers in print and Kindle format. Or contact us for details.